I have some exciting news! 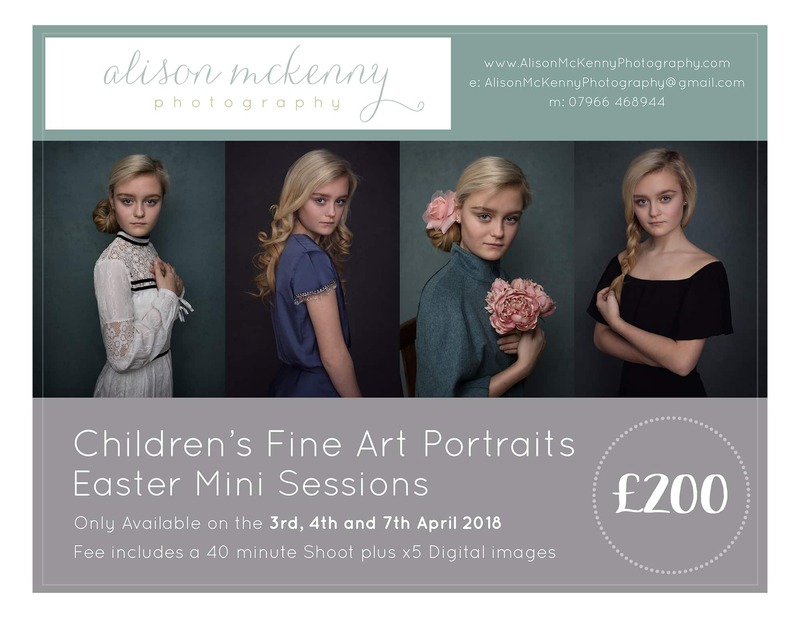 As my Mini Sessions proved so popular last year, I thought I would offer some more this year, so over the Easter holidays, I have decided to make Fine Art Portraiture Mini Sessions available on the 3rd, 4th or 7th of April. There are only 3 sessions per day at 2pm and 3.30pm. They are priced at £200 for the 40-minute shoot, use of my props and studio wardrobe and x5 (from a choice of 10) fully retouched digital images on our downloadable web gallery. These sessions are only suitable for children age 5 up to 18 as they are posed portraits, they need to be able to follow direction. I am used to working with children of all ages and will direct them fully so they needn’t be nervous if they are unsure what to do. I am happy to photograph up to 3 children in any one session as long as they are siblings. Cousins or Friends will need to book their own session although we can cross over time if you would like them photographed together. I will not be offering these sessions at such a reduced rate again this year, so if this type of shoot is of interest to you, I would grab the opportunity while you can. Your booking will only be guaranteed when your payment is made in full. This will take you to our Booking Page, scroll down to find the Mini Sessions – Easter Mini Session – Fine Art Children’s Portraits. Click on there and then choose what time you would like on either the 3rd, 4th, 7th or 11th of April. Bookings on other dates are not available at this price and will be refunded if the wrong date is selected. If you are unsure or would like some assistance, feel free to call me on 07966 468944. To have a look at my Children’s Fine Art Portrait Gallery, please click here. I have chosen photos of Kwani from a recent shoot we did but there are lots of examples of both Boys and Girls of all ages on my gallery. Looking forward to hearing from you and to photographing your beautiful children! This entry was posted in Alison McKenny Photography Studio, Children, Children's Fine Art Portraits, Childrens portraits, Family shoot, Fine Art Studio Shoot, Portrait Photography, Teen photos, Teenagers and tagged Childrens Photo Shoot Sudbury, Fine Art Photographer Suffolk, Kids photographer Bury St Edmunds, Kids Photographer Newmarket, Portrait Photographer Suffolk. Bookmark the permalink.